This is it, ladies and gents, the long overdue article you’ve all been highly anticipating. Get your popcorns, calculators and pitchforks ready, we’re talking about the new ManageWP Orion pricing model. Update: Terrified of the wall of text below? Read the TL;DR version here that gets straight to the point. We’re one of the rare WordPress services where you don’t need to commit to a whole year of service. You’re able to scale your subscription on the fly, both up and down, and get a pro rated refund. We made sure you are able to vote with your wallet and cancel your subscription if you ever feel you’re not getting what you pay for. When we started working on Orion, the objective was simple: tear everything down, rebuild ManageWP from scratch to make it rock solid. So when pricing came up, we threw out the WordPress norms and took the risk of building a pricing model that you need, instead of a pricing model you are used to. A scalable pricing model is great, but you’re not paying us to play around with the pricing slider. You need to manage websites efficiently, and we need to take care of everything else. You need a clear, transparent pricing model. Optimize the cost, maximize the flexibility. Such a model does not exist in the WordPress ecosystem. So we expanded the search and found Amazon Web Services. Orion is running on AWS, so we have a lot of experience with a number of their services. The beauty of the AWS pricing model is that it does not stand in the way of your work. It does not upsell packages, doesn’t prompt you to pull out your card every time you want to bring a server online. You do your thing, and AWS keeps the score and sends you the bill at the end of the month. The new prices are much more appealing compared to the first round of surveys, and in general. I’m happy with this structure. We ran a series of pricing surveys, tested various models with hundreds of current and potential ManageWP users. This is what you liked the most. Let’s say you need backups, client reports and uptime monitoring, nothing else. In the Classic version you have to subscribe to Business, our highest plan, and get everything. In Orion you’ll simply create a custom plan with only the tools you need. This will lower the fee you’re paying for each website. Oh, and you can name your plan, so you’ll finally be able to have a “Deadpool” plan that you’ll pack with all the killer features. Some of your websites need the Daily Backup tool, others need Uptime Monitor, and the third group needs White Label. No worries, Orion has you covered. Simply create three custom plans and distribute your websites among them. You’ll have all your websites on one dashboard, and you’ll be able to switch between them with a single click. There’s no limit to the number of custom plans you can have on one ManageWP account. I think it is awesome to combine several plans in one account. Now it is possible to maintain customer websites and my own blogs (not frequently updated) in one account. Creating custom plans is a good way to have a free choice in what to use, but don’t have to spent a lot of time configuring each website individually. You’ll now be able to mix an unlimited number of free websites with the premium ones. The free websites have gotten a lot of love, so now you’ll be able to run client reports, track Google Analytics data, manage users, and more. For free. Forever. I LOVE free unlimited- this really opens up onboarding possibilities. I’ll have to get busy designing all the new package breakdowns. Thanks for your hard work team. I hate it when I buy an annual subscription for something, and stop using it after a few months (or worse, force myself to use it so I don’t feel like I’ve wasted my money). That’s why we started thinking about how we could empower you even more, and encourage you to vote with your wallet if you’re ever unhappy with our service. The answer was simple: pay as you go. How does this work? Every day the system keeps tabs on the websites on each premium plan and adds it to your monthly bill. If you need a tool for just one day (e.g. to clone a website), you’ll pay only 1/30th of its monthly cost. This way you can clone a website for just $0.03 (Weekly Backup turned on for one day). You can always check your monthly bill, and be sure that you’ll never pay a cent for a tool you don’t use. This feature could easily reduce your operating cost to a fraction of what you’re paying now. It is fair and if I can choose from site to site and from day to day it is flexible too. We tried to make it as straightforward as possible, so you could easily figure out how the cost will scale. If you know a tool costs $1 per website, you can easily deduct that from the fee you’re charging your client. Another important thing you should note is that we’re switching from per-domain to per-site pricing, meaning each WordPress installation counts as one website, and each subsite in a multisite network counts as one website. We did this mainly because of Orion backups. Their reliability comes at a much higher operating cost for us, and we had to make the switch to protect ourselves from potential abuse. The good news is that, with the free websites, the plan flexibility and the pay-as-you-go model, the savings should offset the cost by a large margin. Getting closer with the new survey. Still pretty steep if you want all the bells and whistles. It’s also worth noting that the current lifetime discounts will be honored. Tool discount: If you need a lot of tools on a particular website, it makes sense to offset the cost. Please note that each plan has its tool discount – you can’t have a plan with 1 tool and another with 2 tools, and get a 5% discount for all. Website discount: a global discount that checks the grand total of all your websites across all premium plans. Loyalty discount: For each year you’ve been an active ManageWP subscriber, you get a 10% loyalty discount. If you currently have a lifetime ManageWP discount, the larger of the two will apply (e.g. you have 20% loyalty and 10% lifetime discounts, only the loyalty will apply). Prepaid discount: Charge your ManageWP balance in advance, and avoid potential billing issues and invoice hassle. The Orion model does not support long term commitment because of its flexibility. This is bad news for those of you on an annual plan. It’s also bad news for those who experienced problems with our current payment processor. So we came up with a way to handle subscriptions in the long run, avoid invoice hassle and potential billing problems. The prepaid/balance concept is basically like PayPal balance. Let’s say your monthly subscription is $20. Instead of letting the system charge your card $20 every month, you could add $240 to your credit right away, and have only one ManageWP invoice for the whole year. The system will always try deducting from your balance first. You’ll also get the extra $9.60 credit on your balance (the discount picture is a bit confusing, as prepaid does not actually reduce the fee, but adds extra credit). We don’t plan on stopping there. As we reached Orion milestones, we talked about ways to improve different tools. Right now we’re working on Automated Performance & Security Checks, Automated Client Report and in-depth Client Report Customization. These tools will be released 1-2 months after Classic ManageWP is phased out. We’ve got even more ambitious plans for the future: security, hosting and more. We will soon publish a new roadmap that will cover these subjects. I like being able to select the upgrades I want/need for each website, thereby controlling my costs. Each backup is treated separately for pricing purposes (e.g. you don’t need to pay for both Daily and Weekly if you need the Daily Backup). Each backup tool comes with manual backup and cloning capability. Weekly Backup runs automatically once per week. Daily Backup runs either once per day, or a couple of times per week. Real-time Backup runs once every hour, or 2-4 times per day. I was surprised at the cost for real-time backups, but otherwise everything seems pretty reasonable. The first impression might be that Real-time Backup is too expensive, but think about this: each week, Weekly Backup makes 1 automatic restore point. Daily makes 7 restore points. Real-time is triggered every hour, creating up to 168 restore points each week. That’s 168 times more restore points for just 7 times higher fee. As nice as the new backups are, I think I would not use them or at least not right away. I’m comfortable with the free backup plugin that I currently use and I like that the backups are stored on my own personal AmazonS3 account and I can access them even after I remove a site from my ManageWP account. It’s not just Susan. A lot of you asked for the option to automatically upload the backup archives to an external destination you own. As much as we tried finding an acceptable solution, we couldn’t incorporate this feature into current tools, without bumping up the cost for everyone. So the solution was simple: upload as much as you want, for a transparent fee. Orion backups are stored on Amazon infrastructure, and with the $0.10/GB transfer rate we’ve covered the transfer cost to your own destination without making backups expensive for everyone. Keeping backups on our own Amazon infrastructure is included in the backup tool price. ManageWP has always been about quality. You need the best service possible, so we made damn sure you get it. We supported your businesses for years, and earned your trust. That’s why it’s imperative that we figure out the switch from Classic to Orion that you will be happy with. In 6-8 weeks the Classic dashboard will be phased out. Orion dashboard will become the only ManageWP dashboard, and the Orion pricing model will go live. I mentioned earlier that we’re switching from per-domain to per-site pricing. If you have excess websites, they will not be removed automatically. Let’s say you have a Professional (10 domains) subscription, with 10 websites on these domains and another 4 on subdomains. As long as you have these 14 websites on the legacy plan, you’ll be able to manage them as usual. You will not be able to add more websites from the same domains, and if you remove the excess websites, you will not be able to put them on the legacy plan again, if they are over the website limit. Honestly, Orion is a fabulous piece of work. If you want to try a new tool, or simply want to try out the new pricing model, you don’t have to cancel your legacy subscription. Create a new custom plan, enter your billing information, and try it out. This way you don’t need to commit to just one pricing model, but make a gradual switch at your own pace. The reason you’ll be prompted to enter your billing info when you switch to the Orion model is because it’s powered by Stripe. It is a much more robust and flexible solution, and we’re hoping this will resolve a number of problems you had with ManageWP payments in the past. Our main concern with the switch is that we might disrupt your business model. In some cases the monthly fee might go up and eat your profit. We will not allow this to happen. I’m a bit sad to see the massive $7 price tag on the new real time backup. But I fully understand what you went through in creating this, and I understand it has to be priced according to value. I was hoping to WOW my current clients with it as an ‘upgrade’ to their existing service, but I’ll just create another upsell tier, and frame it as part of an increased service on my part “”screwed something up? Email me with the time and I’ll roll your site back!“”.. magic. I wrote an article a while back on how WordPress professionals often grossly underprice their service. How much did you pay your plumber the last time he fixed your faucet? $50? And you’re providing a vital service that’s protecting their business for what, $5/month? We both know you’re worth way more than that. One way to turn the tables is to frame the new Orion tools the right way. For example, Real-time backups are a new tier of service, bringing additional value to your clients. Your service makes a snapshot of the client’s website every hour of every day. Over 650 restore points each month. That’s worth at least $70 to your clients. If clients want weekly, daily or real-time back-ups they’ll need to pay for them, ditto for up-time monitoring, etc. Some of the sites I would have on ManageWP would be there simply to save me the hassle of having to fix things because the client forgot to update, etc. But some clients do want managed services and willing to pay for it, so this set-up is perfect. The pricing is fine; very affordable and great for getting clients to agree while still leaving room for some margin on the developers end. As we introduce new tools, you’ll be able to build higher tiers and provide more value to your clients, while at the same time you’ll have less hassle since ManageWP is doing everything for you. Here are two use case examples how you can benefit from the new pricing model that comes with Orion. Vince is happy with the ManageWP service. The only tool he’s missing is Uptime Monitor, but the Business plan costs twice as much than what he’s currently paying. He also has 10 websites that he doesn’t keep on ManageWP. These are mostly fun side projects, with a few belonging to his friends. They don’t bring in any money, so it doesn’t make sense to pay to have them on ManageWP. 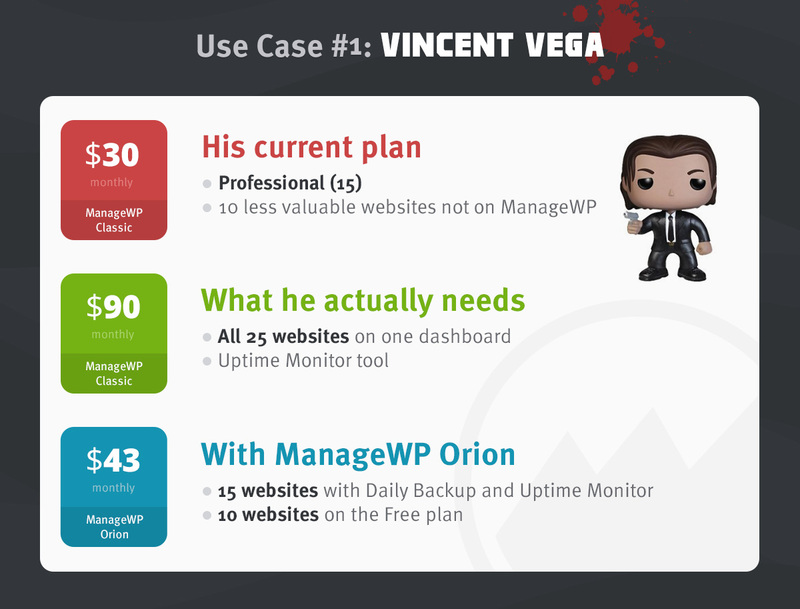 Orion is perfect for Vince: it lets him use Uptime Monitor without the massive price hike. And now he’s able to have all of his websites on one dashboard, which makes things a lot easier for Vince. Mia does not mind paying the Business price tag, even though she doesn’t need all the available tools. She offers two tiers of service, but it’s too much hassle to maintain two separate ManageWP accounts, so she put all her websites on one account. Orion allows her to mix and match plans to match the tiers of her service. For the lower tier she created a plan with Weekly Backup and White Label. The higher tier has Daily Backup, White Label and Uptime Monitor. 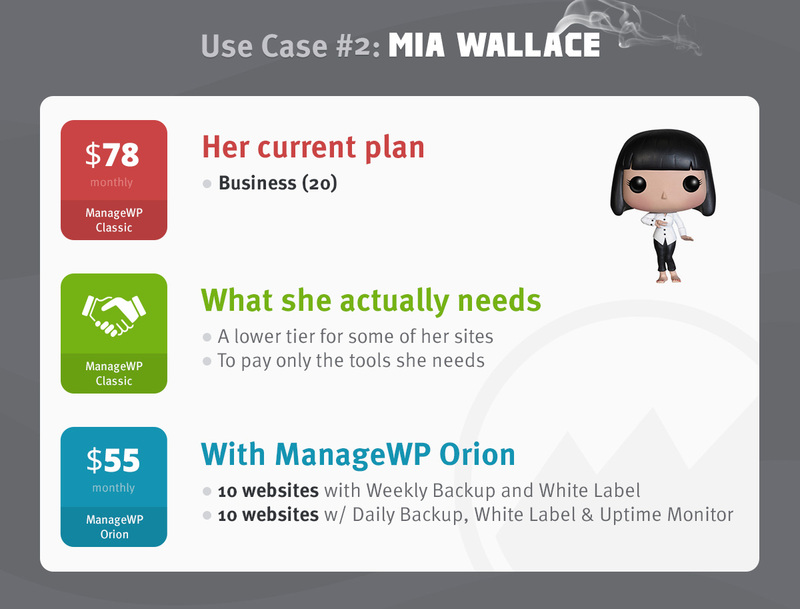 Mia optimized her cost, bringing down her monthly fee from $78/month to just $55/month. We gathered a ton of feedback during the pricing surveys. Here are some of the most commonly asked questions. I think the price for uptime monitoring is a bit too high. This is a tool you don’t need much server resources for and there are free tools for it. Perhaps it would be an idea to have a smaller plan for 0.5$ with a reduced checking interval. Most of our tools have a free alternative. The thing is, those same free tools existed way back in 2010 when we started working on ManageWP. We weren’t trying to build another free service. We wanted to build a service that saves you a huge amount of time (4h/month per website, according to our survey). That’s why, whenever we had to make a time-vs-money decision, we chose the option that saves time. In this particular case, Uptime Monitor lets you see all the websites from one dashboard. Everything is logged. The history can be included in the Client Report. You get unlimited email, SMS and (in the near future) Slack notifications. And with all the discounts, you can actually get this tool for less than $0.50 per month. If you go down this pricing route, your revenue model from me could go from $67 to NIL. Plus I might as well put another 50 sites on here for free that don’t pay for backup because they are ours and we use another plugin for backups. If you’re happy with just the free features, we’re happy as well. Even if you don’t go premium at some point, you’ll recommend us to others, and maybe even give us a fist bump if you ever meet us at a WordCamp. I think it’s flexible enough. Although I still think $1/website for White Label is unreasonable. Should be a one-time or monthly fee for the whole account. Simplicity: We already have several novel concepts, we’d rather not complicate our pricing model further (that’s one of the reasons the Collaborate tool is free, even though it’s a part of the Professional plan in Classic). Value: We don’t mind you using our service for free, as long as your clients can see ManageWP. If you’re looking to white label our plugin, you’re automatically providing greater value that you’re planning to charge. Fair fee for everyone: It wouldn’t be fair that one person with 3 websites and another with 75 websites pay the same $20/month fee. It’s too much. Paying per site in modular system is not fair. I like to pay for modules and use them limitless. As a software-as-a-service, we don’t have this kind of luxury. Our goal is not to sell you a piece of software and stop caring until the annual renewal comes around. We watch over your ManageWP dashboard 24/7 and make sure everything is running smoothly and securely. It does not matter if you’re free or premium, our Customer Happiness team is here for you, day and night. So, if you have 200 backups running, it’s not the same as having just 1 backup. It costs us more to keep your dashboard running, the odds of troubleshooting a support ticket are much higher, etc. There’s also the question of a fair fee. When you’re just starting a business, you’re not really able to cough up $500 for a piece of software that you might not even need in a few months. The per-site pricing is here to help you optimize cost in those early days when you need to focus on breaking even. As your business grows, so does the monthly fee. I know that this is not usual in the WordPress ecosystem, but I believe it’s the most fair model. The new Orion plans are cheaper for me. How will I switch the plans to Orion and will i get a credit for the difference? When the Orion plans go live, you just need to move your websites to one of the custom Orion plans, and cancel your Classic subscription. When you cancel, let us know what you want us to do with the remaining credit: we can issue a refund, or move it to your balance. We built a pricing model that takes even more hassle out of your busy schedule, and optimizes your operating cost. We included several novel concepts that might take a bit to get used to, but once you’ve settled in, you’ll never look back. Every day you’re finding inspiring ways to put WordPress to good use. Our task is to handle the distractions for you. We’ll keep improving, so you can as well. I would like to use the ORION pricing. It has been a little over 8 weeksn since this blog. Do you have a set date when the old pricing will be phased out? The new pricing should arrive in the next month or so. Current subscribers will keep the legacy plan, until they decide to switch to the Orion pricing model. I will publish a status update on our blog in the next two weeks. Its been almost 3 weeks, is there a status update yet? Hey there, any idea how far away the switch to the new pricing is? The new model’s really going to work for us, and I don’t want to have to change my plan before the switch if I can avoid it. We missed the deadline we initially set, but the development is going well and the new pricing should arrive in the next month or so. I will publish a status update on our blog in the next two weeks. I am very disappointed with this price model. They are giving an excuse to be able to select only tools you want to use to raise prices. If I apply what I use in my current plan to the conditions of the new model I would have an increase of 400%. What does not make any sense. I can not agree with this model in any way. Are you sure your math is on point? I checked your plan, and it’s more like 50% more. You also get a way better dashboard and a rock-solid backup with free off-site storage included. 1. Bulk search for posts (to delete them)? 2. Website “Groups”? Or is that what “Tags” or “Clients” are for?? 1) Post and page management will not be available out of the box. It will be possible to use Code Snippets, but it’s not as seamless as having a separate tool for this. 2) Yes, Tags and Clients have replaced Groups in Orion. Tags work pretty much the same as Groups, and Clients have additional benefits – e.g. if you enter the client’s email in their description, you will be able to turn on Uptime Monitor emails and send them client reports without having to enter their email again. I am currently paying for professional 75. Current websites total 67… I have been enjoying the use of orion and all the extra facilities available, but until I calculate which websites require which plan, I am feeling a little concerned of the taste test made available not realising to continue with these extras will cost more. Even to continue doing a daily backup is going to cost my small business a lot more money than I am paying now. No matter what type of website you have a backup of some sort, is a requirement. I have relied on managewp for so long, doing everything that I require, I have not had to look for other plugins for any of the requirements that I offer my clients. I think I will reserve my final opinion until everything is up and running. I am hoping that I will not require moving from managewp… as the service has been invaluable…. 1) You will not be forced to switch to Orion payment model. You will be grandfathered, so you can keep managing 75 websites for the same price you’re paying now. Do you know how long it would be until offsite, manual backups happen? I have one client who, as part of their contract with us, requires weekly backups to be uploaded to Google Drive for their own archival storage. (It’s a government website and archival storage is required by law in their town.) This is over and beyond the regular backups we make for the site. I can’t have downtime for this function. I’m willing to manually upload them if you can provide a way for me to manually get them from your S3. I completely understand. The ability to download the backup is already live – you’ll see a Download button on the Backup screen. Click it, and in a minute or two a download link will be ready. Backup upload to external destinations will be live before Classic gets phased out. There are a lot of users that maintain government websites across the world, so this option is a must. I have just had a look at the Orion Dashboard. I cannot see how to add posts and pages across multiple sites. Where has this feature gone? The bulk posting feature has been abandoned. It was not able to support advanced posting features, and it only created clones of posts and pages that were penalized by Google. The advanced users who spun content, did so by publishing posts with the Code Snippets tool, that’s coming to Orion soon. Bulk posting through has been central to our business for over 3 years. So this news means we are now in crisis control. We had tried InfiniteWP but yours was a far superior and reliable solution. A. How did “Advanced users who spun content” use code snippets and will code snippets be available in Orion before Classic us shut down? B. If “A” is not possible, how long have we got before Classic is shut down before we find an alternative to ManageWP? This is a great resource explains several ways to post an article. Our Code Snippets tool takes care of the bulk part, by executing the script on multiple websites. You can try the scripts in Classic and see if this is a viable option. We will review the best ones and add them to the Code Snippet’s public library, so you should be covered. The Classic ManageWP will be phased out in roughly 8 weeks. Can you please provide an update on the date Classic ManageWP (and the bulk posting feature) will end for us. We want to make sure we have all of our sites correctly set-up. Even after Orion is released, all active subscribers will still be able to access their Classic dashboards. The dates aren’t fixed yet, but the bulk posting feature and your Classic dashboard will definitely remain active until the end of summer, probably even longer. Free users and new users (those that came after Orion pricing goes live) will not have the mirror option and the Classic dashboard. Seems legit. Especially as the massive growth in the WP ecosystem starts to flatten out like it’s already begun to do. This is more a la carte than bundled, like the model cable companies, networks, and phone carriers are moving. Rather than keep hemorrhaging customers, they’re rolling out way smaller bundles and testing complete roll-your-own plans. I’m evolving my business and have been actively looking around for a bit more flexibility. Not much, just something with a little more elbow room to deal with the fluid mix of clients. I’ve had a couple clients with me for almost a decade, helping them grow into pretty sizable companies. Nice to have infrastructure essentials like MWP that let me grow with them as needed. Nice to see I won’t have to leave. I’ve got a couple of demos to cancel. Heh. Question on backups: we’re currently backing up to S3. I’m a little fuzzy on whether we’ll still be able to use our S3, or will backups now be in your S3 exclusively? Thx for providing such a fine professional management platform, and TIA for any clarity you can provide on that backup question. Our S3 comes bundled with the Backup tool. Our developers are currently working on the option of sending backups from our S3 bucket to a 3rd party destination: S3, Dropbox, Google Drive. The upload to these external destinations will be charged extra, $0.10/GB. This is approximately the rate we’re paying Amazon for the service. It’s not an ideal solution, but it’s at least something until we engineer a way to seamlessly integrate 3rd party storage. It frustrates me to read some of the very negative comments here about the new pricing. Of course nobody likes paying more, so it stands to reason a few will complain, however I see a worrying undertone that suggests the product isn’t somehow still value for money. I believe this is the reason that highly motivated, highly intellectual, multi-skilled business owners who provide web design, development, and website hosting services have such a tough time earning a living. If the average website owner didn’t have so many ridiculously cheap options, we wouldn'[t have this predicament. Could you open a real store, or rent a place of business for $5/mth? The amount a website owner should pay, shouldn’t be driven by your cost, it’s should be a direct reflection on the value of their own IP and the continuity of their business. I see Orion as something that’s valuable enough to absorb the cost, even without passing it on t my clients, but perhaps that’s because I choose not to assume that Orion’s services should somehow fit a price point that matches my own business model. If you do not value the data that this service protects, or your clients do not value their own data enough to care, then move along. I also feel It’s time the industry took a look at the way it’s cannabilising itself. Just because you have 100 or 200, or 1000 clients, doesn’t mean your competing with GoDaddy! If you can’t offer your own, bespoke automated systems to add value to your services, then don’t complain when someone who does puts a value on this. In this regard, customers need to be re-educated, and should get used to the fact that quality takes time and costs money. We’ve all had that moment where we need to call our telephone or energy provider and shudder at the thought of waiting on hold, talking to someone in a call centre and being treated like a number. If that’s the service you provide, then “pony up” and offer those value added services you think you can afford for such a low fee. Otherwise, do what the rest of us do, and be reasonable about how you market these services and don’t pretend you’re something you’re not. Personally, I love the analogy used by Nemanja “How much did you pay your plumber the last time he fixed your faucet?” Heck, if I can’t earn as much as my local plumber with my set of skills then why am I bothering with all of this? Wow, what a rant. Great work to all the team at Orion by the way. I love the product, and could care less about the price changes. I’m the last person to welcome a price increase, however I for one respect for the value your product provides and can honestly say it makes my job, and my life easier. It was an awesome rant, if I may say. I’m not that concerned with some users leaving – with every change there are those who stand to gain, and those who stand to lose. We tried to get as many users on the winning side, but it can never be 100%. What I’m concerned with is that those users will keep charging a few bucks per month, and effectively bury themselves under a ton of menial work that barely covers their living expenses. It’s happened to me in the past, and it’s probably the most common error the people in the web development make. Thanks! That is so much better haha! BUT …. I currently pay for a business plan as I want more than 5 sites. But I don’t use backup, I just use it mainly to update themes and plugins. As far as I can see my ‘Per Site’ pricing drops to zero if I don’t use any of the Premium features but I can have unlimited sites, correct? Hehe, in that case I’d put “very long and overdue article”. You are correct. There’s no cap for the number of websites you have on your dashboard for free, so you will no longer need the subscription. I read somewhere here that “the cost of backups is linear and there is not much wiggle room”. Daily backup costs 2$, weekly costs 1$. Doesn’t seem that much linear to me. Weekly should cost 0.30$ if the backup cost was linear. I don’t need “white label”, but it seems to me that “white label” doesn’t eat up just server resources like backups do, yet it still costs 1$/per site. I’m very disappointed reading about the new pricing plan. Combine backup pricing with per-site pricing update, and now instead of $7.50 we’ll have to pay $85.50. Even if I ramp down to weekly backups with uptime monitor I still have to pay $38 per month. That’s quite the change, considering how long it took to set everything up. I thought Orion was going to make ManageWP awesome with a nice UI. Instead, I will have to look for a different backup/uptime solution and only use the free features. p.s. For a “Business plan” 24 sites cost $102.60; 25 sites cost $101.25 – this is a half-baked pricing plan. Assuming the number of backups for a site is finite, a daily and weekly will take the same amount of server space. It will just have X number of backups. The cost is linear per site. I wouldn;t have thought the charge is for the running of the backup but for the space each takes. But then, the backups for each site will be different sizes I imagine so … they don’t work out linear that way either. The linear cost was actually in relation to us switching to a per-site pricing. Let’s say that, for the sake of argument, I’ve got 10 websites on 1 domain. In Classic, the backups are running on site server, and there’s zero cost to ManageWP. With Orion I’ll assume that the backups cost $2, with $1.50 being the operating cost, and $0.50 the profit (not real figures). So, if we kept the per-domain pricing model, the $2 we get would not be enough to cover the $15 operating cost. The interesting thing is that we’re ready to take this hit with the existing users (hence the grandfathering of all ManageWP subscribers, and not forcing them to remove excess websites). We owe it to them to let their business run the way it’s been running. But new users will only be able to access the balanced, per-site model. Just wondering, how will sub-domains be treated under the new system? Will they be charged as individual sites? They’re switching to per-installation pricing. Our subscription price is going to fly through the roof because of that. Yes, they are treated as individual websites. The good news is that you’ll be able to have unlimited free websites on your dashboard, so if you’re using these subdomains for testing or development, you’ll keep them on the Free plan, and turn them on from time to time to do a restore/clone, at a minimal cost. Please note that all existing users will be grandfathered, both when it comes to the subscription, and when it comes to the number of websites you have on your dashboard. I LOVE this new pricing flexibility, it is exactly what I need and, to be honest, the only reason I’ve been hesitating. The only missing element, for folks outside the US is paying by Paypal on a recurring basis. Our Paypal account is ‘company’ but your only payment methods require a credit card. Even if you added a fee for using Paypal, it would make it MUCH easier for some of us. I’ve got some great news, Andrew! PayPal was (and still is) a big challenge to implement, because we need to be able to change the renewal date and fee on the fly. PayPal subscriptions do not support that out of the box, because that would be a huge liability. Imagine if you signed up for a $5/month service, only to be charged $1,000 next month. But we’re a persistent lot, so we got in touch with PayPal to try and figure something out. We’re currently working on obtaining a special permit that would allow us to make these changes. I everything goes well, we will include PayPal as a payment option in the last quarter of 2016. What about adding an option to prepay, and then deduct charges from that? There’s a paragraph in the wall of text titled “Prepaid” that contains all the info, but basically you’ll be able to prepay with your card, and all future charges will be deducted from the balance first. You also get extra credit when you prepay (up to 10%). I got 95 websites currently added and 15 more waiting to be added, and i feel like a user like myself is punished for having a lot of sites? Yes we require more “room” for backups, but we bring clients to manageWP, i dont feel the discounts is anough. We (myself and other of your clients with a bit more sites) recommend this and we use this, it is our amount of users you get payed from. The discount’s is simply not enough.. I currently have 95 websites, where i pay for a proffesional plan (business is too expensive too for the white label)… if i walk away, you loose the income from 95 websites, not just a few personally owned sites, i / we got a lot of sites, and it is simply not resonable to charge us more for nothing. Classic will go away, but not the Classic pricing. You will be able to choose if you want to keep paying your current subscription, or switch to the Orion pricing model. Since pretty much everything is done on our end, the operating cost is much higher. Now, if you’re perfectly happy with the way things are right now, I’d advise the following: some time in the near future upgrade to Professional (150) to make sue you have plenty of room to grow (it’s only $12/month for those extra 50 slots), and stick with that subscription. 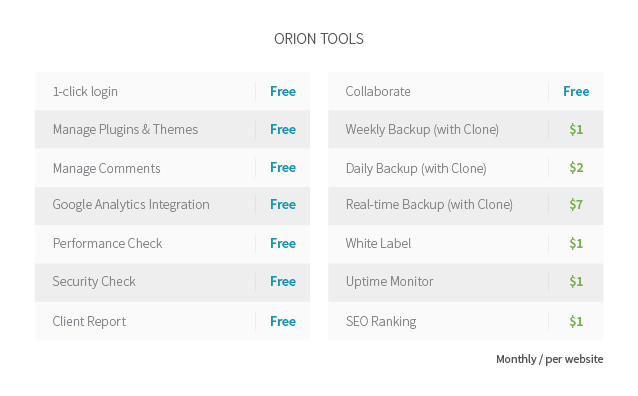 You’ll get the Daily Orion Backup automatically for the old price, which is as good as it gets. I can’t see that you are being ‘punished’ for having lots of clients. As I see it, there is a clear pricing model, scaled according to the needs of your/my clients and at rates that are infinitely affordable enough to add a serious margin ‘per client’. If you have 95 clients paying you and 15 more waiting to be added, I can’t see that you have anything to lose except a great income for a service that will cost you ‘pennies’, relatively. Sorry, I don’t get it. Either I’m too busy to take time to digest all this, or it’s too complicated. (hint: it’s not about you). I Googled the “Orion Billing Calculator” and it doesn’t really help either. It’s also too complicated. I occasionally use Clone, but I can get along without it. I use daily classic backups, but I have other avenues for that, as you well know. And I use Code Snippets. In Orion, Clone is buried / bundled / non-existent. I don’t want to bother my bookkeeper with tracking a $0.03 charge to do a one-time clone. That’s a net loss for any company. Backups are easy to do another way that won’t involve me trying to upsell my clients. And the future of Code Snippets in Orion is never mentioned. You made a nice looking UI. It’s lovely. And I have no doubt that the new code is clean and de-spaghettified, at least for the moment. But I fail to see why I want to stick with this. You have mentioned, and continued to mention, how much time you can save me per month. Then you go and make these fundamental changes that require me to, at best, spend time learning / calculating prices / migrating. And at worst, spend time upselling clients. Somewhere in the middle, I have to do more accounting work to deal with micro transactions. No thanks. I’m glad you wrote this, because some of the problems have been addressed in Orion. Code Snippets will be available for free to all Orion users. It’s a small and simple tool, so it’s not listed anywhere. Regarding the transactions, you could simply transfer $10 to your balance, and cover your cloning expense for the next 7 years (if you clone a website once per week). So that’s one receipt in 7 years, as opposed to the monthly (or annual) receipt you get right now. As I mentioned in an earlier reply, the system itself is simple, but I went into tiny details because our users need to make an informed decision, even if that decision is to stop using ManageWP. It’s also the reason we’re grandfathering everyone, so you won’t have to change anything if you’re happy with the way things are right now. A TL;DR version of this article is coming on Monday, it will make it easier to explain everything. I am SO EXCITED about these changes. I have only been using ManageWP, and the only reason I did not join earlier was because I have different needs for different groups of websites, and I hated (HATED) the all-or-nothing approach. Modeling on AWS was brilliant. Can I switch over RIGHT NOW? You can start using Orion if you’re already a ManageWP user – simply click the tab button at the top right of your ManageWP dashboard. The pricing itself will go live in 6-8 weeks, when the Classic dashboard gets phased out. Why in the world did you go to such a complicated business model? I don’t even have time to read the full post, let alone figure out the pricing for the 25-site plan I have now plus another 75 or so sites I haven’t put in yet. We’ll be moving to another provider pronto. This post makes me feel like I’m at a restaurant with 200 items on the menu. By the time I finish reading, I’m not hungry anymore. Not to worry, Meg. There will be a TL;DR version on Monday. The model is a very simple – drag-and-drop, pay-as-you-go, but I wanted to go into all the gory details because our users want to make an informed decision and figure out how their businesses can profit from the change. Thanks for this… long awaited for sure! No brainer–can’t switch fast enough to the new pricing plans. Doesn’t matter what the cost is, as long as I know what it is I can factor it into the service. Really looking forward to passing along all the various new flexibility that comes with Orion too (three tiers of backups, etc.). Hvala (puno)! I agree Michael. A great and simple pricing structure, ‘pay per client’ and mark it up accordingly. Exactly what I was looking for! Two things are still confusing. You mention manual backups, but where is that in your pricing system? Also, where does multifactor authentication come into play. That was an up-price prior to Orion for other than an email auth. Manual backups and cloning are bundled with each Backup tool (Weekly/Daily/Real-time). I actually mentioned it somewhere in the wall of text above (I’m currently working on a TL;DR edition). Email 2-factor authentication will always be free, just like in Classic (security should not be a premium option). SMS 2FA is free for now, but the plan is to replace it with Google Authenticator some time after Classic gets phased out. The problem with SMS 2FA (apart from the fact that it’s expensive) is that there are a lot of mobile carriers who block A2P (application-to-person) messages, because they assume it’s SMS marketing. Google Authenticator provides an excellent, free and reliable alternative. I like GA. It’s good and reliable. I support that effort. Great update! I have several WP sites but none are professional, but this update is clear enough for me to want to upgrade 2 of my sites to paid backups. Well my price went down and then up… after I added on the features I want. I guess it’s a win for me, it just depends on how bad I want it now. This is great! Loving the new Orion user-interface and all the new features. I don’t mind the complex pricing, it seems more fair overall. At 50+ sites, we’ll end up paying a bit more per month, but should be well worth it. 1) Any possibility for 2x daily backup? This has been an option in Orion Beta for professional users. Backups every 12 hours should cover most scenarios and seems a bit safer than 1x daily — without going too crazy with hourly backups. 2) With the new automated client reports, how much customization will be allowed? For example, removing or adding sections or subsections, saving report templates to quickly apply to new clients, weekly generation and sending via email, areas to add in custom notes or pull data from other 3rd party apps or plugins such as gravity forms (new leads) or mailchimp (email marketing stats), etc. This reporting feature just might be your most valuable feature to work on, it can help agencies more easily communicate value and ROI — keeping their clients happy and in turn giving you more business. 3) In Beta, we’ve had a couple issues with the clone & restore tool throwing errors and not working. Also some troubles with adding the FTP info. No worries, as I’m sure you guys are still working out some bugs there – but just curious if that’s a known issue. 1) The Real-time Backup will have the option of scaling down the frequency to 2-4 backups per day. 2) You already have the option of adding and removing sections (each section being a different ManageWP tool). Templates will be added soon. Weekly/monthly generation as well. With automated white labeled emails we’re currently having a problem: we use Mandrill for the Client Report emails, and with their policy changes, we’re no longer able to replace our email with yours (e.g. to make it appear that the report has been sent from james@wordpressmaintenance.com). We’re currently working on finding a solution for this. We’re also working on allowing you to pull 3rd party data into the Client Report through our API. Oh, and let’s not forget the most important feature: localization. 3) Reliable clone and restore are our number one priority. We put our best developers on it for the past ~6 months, and they’re now running smoothly. BTW you can track minor improvements from your dashboard – you’ll find the Changelog link at the top right of your Orion dashboard. Thank you. The per-service pricing will save me money and trouble, since I currently maintain two accounts because of differing needs. I love the Oriion setup and am looking forward to seeing the changes implemented. Looking forward to it! This is awesome. I’m pumped! This pricing model looks great. I’m definitely going to be adding some premium features to some of my current ‘free plan’ websites. If anybody is still reading down this far in the comments, you should go back to work. As should I. Just had to say, never in the history of history has a company been this transparent and inclusive regarding changes to pricing and services. This is a testament to the quality of customer care and attention to detail from the team. The options and accommodations for smooth transitioning to the new system and pricing are almost over-the-top (where’s my latte?) and I can’t believe it’s still not enough for some. Glad to see mostly appreciation tho. Let’s get on with it! I’ve seen many touching comments from our customers over the years, but yours made me especially proud of my team. Thanks Jeff! We have that in Classic, and a lot of people pay more than they should. It’s a lot to take in, I agree, but once we get the onboarding online, it will be as easy as 1-2-3. It seems like the Pricing Calculator on calc.devana.rs/602197557893 is a little off. The Existing Discount section doesn’t calculate correctly. The easiest way to notice this is if you put 100 sites in Professional section and 100% in the “existing discount” section. I would expect to get a Estimated Monthly Price of $0 but you get -$40.00. So either it is miscalculating the cost or there is some extra discount happening there. I have not problem taking the extra discount. lol Just thought it would be helpful to point that out. Could you can either update the calculator or note somewhere what is going on with this extra discount. Yeah, it adds the bulk website discount and throws the total price off, if all the discounts add up to over 100%. As long as the existing discount is below 80% (and that’s way more than the actual ManageWP discounts), it will be accurate. We’ll add validation to avoid confusion. Ok so to be clear it is calculating discounts differently then Classic pricing does with”User Discount” and “Billing Discount”? Classic Cost was calculated by taking the billing discount off the original amount then taking that new amount and taking the user discount off of that. This new discount calculation is combining the bulk and the user discount together before being applied. So if it is 20% for Bulk and 30% for User, it actually equals 50% discount off of the original price? That’s correct. The Classic formula was a result of the way our payment processor works. In Orion we decided to set this right by simply adding up the discounts. A lot, actually. I already mentioned in another reply that we’re working on a fully automated, white label Client Report. We’re also working on automated checks that send you an SMS if they notice something out of the ordinary. Not to mention more ambitious projects like security, SEO audit, and more. We’ll soon release a new roadmap that will give you an idea what to expect in the near (and far) future. Not sure about client notes (you’ve got a fairly specific use case), but we’re thinking of something like that for the Client Report. An API call for example. This is still in the brainstorm phase. When it comes to the new, not released yet “Automated Performance & Security Checks, Automated Client Report and in-depth Client Report Customization” where is that going to fall in pricing? Right now your new pricing model shows Performance & Security Checks, and Client Reports are free… are these updates going be free as well? Love the new Orion by the way! Great job! The principle behind our development process is “useful things should be free, but very useful should be premium”. So, roughly 3/4 of what we’re developing are premium tools, but we also improving the free tools. For example, the Client Report will get a premium version that you’ll be able to automate and fully rebrand it. At the same time the free version will get more in depth customization, but not to a point where you can completely hide ManageWP. We’ll soon publish a new roadmap that will give you more insight into what we’re working on. When I ready you were pricing things like Amazon, my heart sank. Although Amazon is a beheamoth with its AWS its pricing is very complicated and because each part is so seperate it soon adds up. However your final pricing is a lot clearer than Amazon and makes perfect sense. I fear those on proffesional packages will end up paying more and those on Business may well save. My only worry though is what happens to those of us who have been beta testing and providing feedback for you, but are on proffesional plans? We have been beta testing and providing feedback on uptime, SEO, backups etc, but when the new system goes live we will loose all those features because we had no idea what the pricing model would be. Ideally I wish we had not started to use the features beyond our plan as it feels a bit bait and switch. I signed up in December with 4 clients and 4 sites and paid upfront for 2 years. If I want to move to the new plans im going to have to absorb the costs myself or look stupid in front of my clients. Its not a complaint, but it is a headache. Overall I think the new pricing makes sense and I like the fact I can pick and choose which services I pay for. The downside of the new pricing is that, no matter how hard we try, some people will get a raw end of the deal. We tried getting this article online over a month ago, but as we kept experimenting with different pricing models, we found better solutions that lead to more experiments. The good news is that it will probably be another two months before the new pricing goes live. This should be plenty of time to redesign the tiers of service, and attempt to move your clients to a higher tier that will still net you profit and save face. We’re already talking to our users who used the pricing change and new tools to redesign their offer. We’ll keep publishing them on our blog, to give you and the others an idea how you can improve your business. I apologize for inadvertently putting you in a tight spot. OK Great, when the new pricing structure comes in and I stick to the proffesional features, will all my data related to the extra features I have been using disappear (uptime, backups etc) permanently? So if i chose to upgrade after a month will the two months of backups, stats etc all be gone whilst I was on the profesional plan? As im now keeping security and uptime metrics it would be good to know if they disappear when im automatically switched to the proffesional version, obviously I may upgrade in the future or use my 2year credit on the new accounts, but it might not be straight away. We still haven’t determined how long we’ll keep the backups when you move a website to the Free plan. Right now we’re storing them indefinitely, but the timeframe will probably be 30 days from the moment the website goes Free. We will publish an article as soon as we figure these things out. All logs are kept indefinitely for now, but we’ll probably set a limit at some point that will let you go back at least a year into the past. Some of our users give clients annual reports, so it makes sense that they can pull up the complete 2015 log in March 2016. I am a little concerned with legacy pricing. We’re currently on a Business plan for 5 years, with approximately 225 sites. Even with the 30% legacy discount and 10% annual payment discount we will go from approximately $192/mo to $342. That is a a 45% increase. Now I understand that we can remain on Legacy pricing and we will be fine, but as we continue to grow, we will eventually have to move outside of our Legacy tier. All of your examples in the pricing are for accounts with a handful of sites (which makes sense, as that’s the bulk of your user base). I understand the “fairness” idea that you’re going with but I’m wondering if you haven’t looked enough at the changes in cost for your higher-end customers. I understand your concern. The problem with Orion backups is that the rise in cost is linear, i.e. backups for 100 websites cost 100 times more than for 1 backup. This leaves us very little wiggle room for higher-end users, such as yourself. We tried offsetting the cost with various discounts, but the price ramps up at 100+ websites. Are you using all the tools on the Business plan? Yeah this is the issue we will be running to as well even on Professional pricing with 100+ site. Sad thing is the old backup solution worked amazingly well for us. so with Orion we are being charged more for something that doesn’t provide us with any new value. Might want to re-evaluate the reasons for removing the old back up solution. We use Backup and Monitoring. White label is nice but not necessary. Honestly, I feel that some of the free tools should be paid and something as basic as white label should be free or simply included once you make it to a certain tier. SEO ranking is unnecessary and the cost calculations I did removed that tool. For example, I’m sure you have the numbers on it, but I can’t imagine client reports are something that a lot of people use. Customized reporting tends to be an add-on option in many SaaS solutions because it’s a pretty specific business need. Just like the new constant backup option – that is something that is premium and most users never need. Regarding white labeling, I do feel that is something that should be an upgrade and once your account reaches a certain billing threshold, simply becomes free. I understand that your offerings have to change and you’re doing a great job communicating what the changes are. But when I have to explain a potential 45% increase to accounting, for the same services we’ve previously had, I’m expecting to be asked to research what other alternatives we could be using. And I really like your product, so that concerns me. Hopefully I don’t have to get to that point. Thanks for the thorough article. I have a couple quick clarification requests. We’re currently on the Classic Standard plan. We have a total of 38 websites, 14 of which are on subdomains (so we haven’t been getting charged extra for them). Aside from the features that will generously be offered for free/unlimited with the new pricing plan, the one thing that is important to us is the manual backups, which we occasionally use to download a site before making a big change. We like the fact that ManageWP/Orion provides this and that we don’t need an extra plugin on all our sites. Our hosting company maintains daily backups for us, but they don’t offer the ability to perform manual backups. Regarding the “optional switch” (i.e., grandfathered legacy plans), you mentioned the following for the Standard plan: “Manual only Orion Backups (not available as a separate tool)”. Can you tell me what exactly “not available as a separate tool” means and how it will affect our situation? My guess is that we’d be able to continue on with our legacy plan without losing anything we need. However, if we switched to the new pricing model, and wanted to keep the ability to perform manual backups, it sounds like our best approach would be to use only the free services and then just turn on the weekly backup feature to enable the manual backup option. If that’s accurate, then based on your estimate above, we would pay about $0.03/site per day so if we ended doing 100 backups in a month, we’d pay about $3 in total for that month (which is significantly less than we’re paying now). Can you let me know if I’m missing anything? Any clarification would be much appreciated. “Not available as a separate tool” means that you can’t switch to Orion and have a cheaper backup tool that does only manual backups. It will be a feature exclusive only to legacy Standard subscribers. Others can, of course, run manual backups, but they’ll also have a scheduled backup option. 1. Stay with the legacy Standard plan. The good thing is that you already have everything set up, and you’re used to your subscription. The bad thing is that you won’t be able to add more websites, as well as return the current ones that you remove from the legacy plan. 2. Game the system. Step 1: Create a custom plan with Weekly Backup. Step 2: Cancel your Standard subscription and move all 38 websites to the custom plan. Step 3: Run manual backups for all 38 sites, and move the to the Free plan. Your total bill for this round will be $1.14 (or around $5/month if you do this once per week, before discounts). It might sound as an exploit, but it’s actually a smart way to micromanage Orion to get your cost down. And guess what? We’re perfectly fine with this. The main thing for us is that you find a way to use Orion that you’d be happy with. Thanks so much for the detailed response and the personalized game plan! Option 2 is slightly more appealing, partly because we will definitely be adding new sites and partly because it sounds like it might actually save us some money in the long run (unless we end up doing tons and tons of manual backups, which is unlikely). We tend to just manually backup an individual site here and there, as opposed to doing all 38 sites at the same time. I’ll be curious to see how easy the process is for switching sites to a custom plan with Weekly Backup and then switching them back to the free plan…that will be an important factor. If you can shed any light on how simple/complex that process is, I’d be very interested to hear about it. Otherwise, I’ll just experiment with it myself in the coming weeks. It’s about as easy as moving websites to another group in the Classic dashboard. Or, if you’re already playing with Orion, it’s as easy as changing tags and clients. I can confirm that backups and cloning will not be possible for multisites in the foreseeable future. Personally, I don’t trust WordPress plugins when it comes to large multisite networks. I’d look for a solution at the server level – most hosts offer daily backups that cannot fail since they control the infrastructure. This is an excellent pricing model! The ability to basically give each site it’s own package is not only awesome for the customer, but smart for you guys. We have only 13 sites on ManageWP, and dozens of other sites on a self-hosted version of InfiniteWP because we couldn’t justify the cost for our smaller clients who aren’t paying us for maintenance but for whom we still need to keep tabs on WordPress. This allows us to move everyone over to ManageWP. Thank you! More online services should follow your example. I’m glad to hear that ManageWP will make your life even easier. I hope others will follow suit. WordPress community needs reliable tools to keep growing, and we’re trying to set an example how to build a reputable, transparent service. From reading the comments, real-time doesn’t sound real-time if it’s only backing up x number of times. If we are to upsell clients on real-time and they make a mistake and then think they can get it rolled back it will cause issues. One benefit for the real-time backup is that it can backup sites that are to big for the old method, will the standard backups use the real time way or will they use the old create a zip and back it up method? The hourly backups are an industry standard – running them more often is frankly a waste of server resources. As far as the “real-time” term goes, I understand the problem. Other WordPress services (like VaultPress) advertise hourly backups as real-time, so we decided to follow suit, but at the same time make it crystal clear that they are run every hour. The most important thing to us is that you, as a ManageWP user, understand how it works. This way you can make an informed decision how to present this service to your clients. Fair enough, I will just say hourly. All Orion backups work the same: there’s no zip archives being created on site. Step 1: The database and files are uploaded to our infrastructure one by one, where they can be accessed remotely. Step 2: You can review and download each file individually, or request a zip archive to be created, so you could download it. Step 3: Since the files are not in a zip archive, it’s easy for us to do CRC checks on subsequent backups, and upload only the new and altered files and tables. This greatly reduces the time and resources involved, which in turn increases the reliability of the backup. thanks, perfect, you should advertise that, great feature and I expect most of us have had sites that won’t back up due to the size of the zip. So on my old plan i was paying $20 for backups. (Professional – 10 websites). The only tool i want is real time backups and now i have to pay $80 for 10 websites? As Barry mentioned, the switch won’t be forced. But please note that Real-time Backup is a brand new feature. Your current Classic backup probably runs on a daily or weekly cycle, that’s why you’ll be grandfathered to Dialy Backup. Real-time is way more reliable from the Classic backup, uses less site server resources, it’s incremental, comes with free off-site storage, and runs once per hour. It’s a beast, and in most cases I’d even recommend against using it on your websites if the content is not changing on an hourly basis. Very informative and honest post. Appreciate you taking the time to explain everything in such detail, you are obviously aware that the pricing is a very emotional and crucial aspect for many customers. We have been testing the waters with the free plan for some time and tried Orion, as well as recommended it to customers who want to do their own management. One reason we stuck with the free plan and additional plugins for backups etc, was that you couldn’t mix in one account. Most sites were small and didn’t need any paid features, mainly just plugin updates management for simplicity. With this new setup, it’ll make us much more likely to use premium features. Hi Karl we always say that our WordPress Management is a ‘Distress Purchase’ nobody really sees the need until they are in trouble. Our ideal client is when they have WordPress 3.9, 19 plugin upgrades and 2 themes to upgrade in addition perfect if they have been hacked. 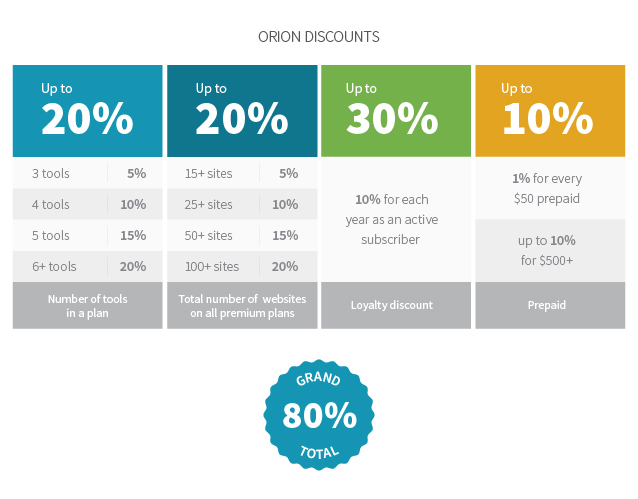 The Orion pricing model now means you have a scalable offering. The Free offer can’t be free as you to have to setup the system and also do a backup in case you break the site. You could always run a separate backup system but if you charged a setup fee, people are used to this, and then offered a 3 to 6-month trial you have covered your weekly backup and updates easily with Orion. We also sell hosting and part of this package includes the trial above. Some clients want more frequent backups or other services so with Orion you now have a price list to offer them, I’m working on our new one at the moment. We also include the ability to purchase time per month to do other jobs for them such changes to the body of the website. It means that you have a range of upsells that you can now offer and a repeat income stream that you can build on so that, in our case, our business overheads are covered each month by our maintenance and hosting packages. Hi Nemanja We have been with you since May 2012 and have tried most of the other management solutions on the market both hosted and self-hosted. Throughout all this we have never found anything that beats ManageWP in delivering the results we want consistently. If you are charging for maintenance your solution has got to be robust and yours has always been so. The rest of the management systems, even the ones that copied yours, always fell by the wayside on the most important thing to us which was backup. Therefore, the development of Orion filled me with trepidation as we had a robust and working system that you were going to fiddle about with. You re-assured me that the changes were necessary and would make the system even better so I joined the beta and put sites on there that we hosted, but were not under management, as a special offer to existing and new clients. After a few months with them not having to worry about upgrades, as they were done for them, they were easy to upgrade to a paid model. All 75 of our managed sites have now been migrated to Orion. I’ll also be putting on around 100 sites we host, but don’t maintain, on the free version and then offer them an upgrade as we did above. 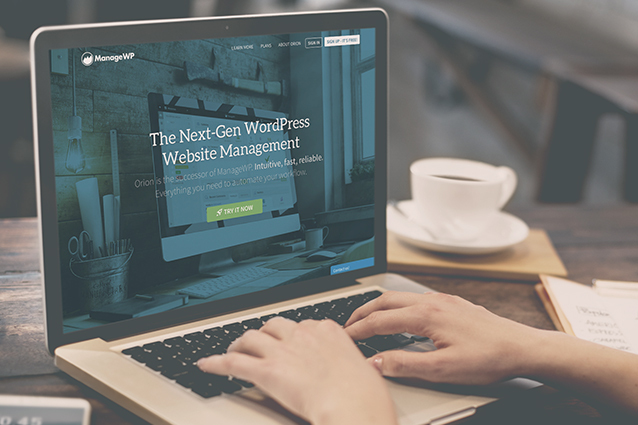 We now have ‘Worry Free WordPress’. It really is about giving you ‘Peace of Mind’ as I know that all the sites on Orion are now updated and backed up on a regular basis and that if it breaks I can fix it quickly. Also every time I log onto the Dashboard I can’t help smiling as you have done such a great job with the interface. Thank you it has been worth the wait. I think that’s a great example of Orion being put to good use. If it’s OK with you, I’d like to follow up via email and create a mini case study that we’d publish on our website. It should create tremendous value to other WordPress professionals that struggling to get their website maintenance service off the ground. The real test for the pricing model is going to be when it actually comes out and people have a go at it. Looking forward to making the switch and digging deep. Nice article about the changing paying model. I would like to know what happens to the affiliates, will it still be possible to share the 30% “affiliate promotion” to the new customer? The affiliate model will change, we still haven’t figured out the details. What I can say right now is that the affiliate system will exist in Orion as well, and that affiliate commissions will keep rolling in even after Classic goes away. If you’re using ManageWP right now, you’ll get regular updates on your ManageWP dashboard (green notifications in Classic, News robot in Orion). You can also keep an eye on our Twitter, Facebook, LinkedIn, or sign up for our blog newsletter. We’re very active and transparent about our development. For those of use that have both a Classic account, and have been beta-testing Orion, will you be merging those accounts, or will we need to do something on our part? When the time comes, the Beta accounts will be converted into regular Orion accounts. You’ll need to move your websites to the other account in order to keep them all on one dashboard. Multisite support for Orion is in the works, and you should be able to manage multisites in the next few weeks. Really appreciate you guys! I love your service and your customer support is the best. I can’t imagine running my business without you. Thank you!! Been w/ ManageWP & Orion for a bit – and honestly you’ve got me so confused…. Am I going to be charged more now? It all depends on what services you choose. I have about 50 sites on the business plan, but being able to pick and choose what service level you want to provide on a site by site basis I will be saving money. I signed up for ManageWP after Orion was in Beta, specifically for the new incremental backup system, which is incredibly resource efficient. For sites with a lot of data to be backup up, other backup plugins just weren’t cutting it. I was trepidatious about the pricing model for Orion, but this seems very fair. Thanks for such a thorough article explaining how you arrived at your pricing model. I completely agree that many WP professionals undercharge for their services. Most reputable WP management/backup services charge at least $30+/mo per website, often more depending on the level of hands-on service they provide, or the frequency of backups. I am trying to process all this information and compare it to the current plans. I am a little unclear at what level the clone feature comes in on the new plans. And as I am almost done with a 14 day trial of Manage WP, I assume that I will need to sign up for a plan on a month to month basis (losing the discount) until you guys go live with the new price model. That’s the beauty of the new model, Brian. There are no levels. Clone is bundled with all the Backup tools, so you can take a Weekly Backup for $1/month and clone your website. This at a quick glance appears to double my costs compared to Classic for essentially the same features. I am really disappointed to see this. I think this pricing model is a huge complication to my business, to be honest. It’s possible my read is wrong. I am not even sure how to start calculating my costs. A bit more analysis now, looking with the percentage discounts, and I *think* I can get it more closely resembling my current pricing by abandoning white labeling, which is good to see. Also, I appreciate that you’ve grand-fathered in our existing plans, but I grow a little each year and add more, so I know that plan will only last me so long. A calculator tool would be really helpful in figuring out pricing, honestly. Really, I don’t mean to sound ungrateful. I’m glad you guys offer this service and your pricing has been great so far. But I bill my clients annually so a middle of the year price increase for me will be hard to absorb, and long-term support is a secondary aspect of my business, so time I spend figuring all this out is not time I make much money on. Nate already mentioned that there’s a calculator buried in the wall of text, I’ll add a picture to make it more prominent. I believe that you can avoid the price increase by simply sticking to your current subscription until you feel comfortable to make the transition. Another option would be to keep your current clients on the old subscription, and get new clients on the Orion pricing from the start. The pricing model is hard to explain, but easy to demonstrate. We’re working on a killer onboarding that will walk you through the process. Thank you for your feedback. We want to hear all the concerns you and other users have, so we could address them before the pricing model goes live. There is a calculator in the post if you read it. http://calc.devana.rs/602197557893. I currently have 50 sites on the business plan, but being about to pick and choose sites on different levels, their new pricing is going to save me money. I’m sick of talking about the pricing. Please take my money. Where do I sign up? Probably the only thing that feels “missing” is the “cloud backup” option. I’d love to be able to access to all my (and my clients’) website backups all at once on, say, Google Drive or Dropbox. Also, the pricing is extremely confusing and might lower your lead-to-customer conversions, but I’m sure you’ve already thought about that. Anyways, I’m using Orion for a week or so, and I’m just loving it. Keep up the awesome work! Look for the “Upload to external destinations” paragraph. The conversion will be an extremely difficult challenge, but we’re confident that, with proper onboarding, it shouldn’t be a problem. That paragraph says nothing about dropbox though… will this be an option in Orion or is the only option for us to go to an AWS? Dropbox, Amazon S3 and Google Drive are planned for now. I’m excited about this! I especially like being able to switch the kinds of backups needed for a specific site. There are a few I know won’t be updated that often and daily just isn’t needed. Thanks for releasing this, it really helps as we were going to be repricing things in the spring. I want to better understand the “Real-Time” backup. Are these the 4 a day backups currently in Orion? Real-time Backup creates a backup once per hour. If you don’t need it that often, you can scale it down to 2-6 backups per day. You’re only seeing 4 a day backups because we limited it while Orion is running in mirror mode, in order to keep the cost down. So when will this take effect, and how do we go about setting up our plans and assigning websites to each plan? BTW, this seems like a very fair pricing model, and I appreciate the time you’ve taken to ensure a good experience for all involved. Thank you for an outstanding service, and the effort to be caring and human in the business approach. Thank you for your kind words, Donna. My team and I always tried to put your interest first when we needed to make tough calls. The fact that we’re still here, and still growing after 5 years means that your trust wasn’t misplaced. In about 45-60 days we’ll phase out the Classic dashboard and institute the new pricing model. Your Classic subscription will be automatically be transferred into Orion. From there, you can start experimenting with the custom plans, and shuffle your websites between the plans. Hi, First off Orion looks really awesome. As a (hopefully?) very soon new customer, I can’t wait integrate this. Is this new pricing model available now? I have several small clients that I would like to get on the free plan so that I can get familiar with ManageWP, before moving the larger clients over. The new pricing model is not live yet, it will take roughly 45-60 days to finish all the minor features we’ve planned to do before phasing out the Classic version. In the meantime you can use the 14-day Trial to get acquainted with ManageWP Orion. Nice Job, im going to price things out as soon as I can to see if it make switching right away! Thanks Nate, and thank you for participating in our surveys. You helped us make this happen!